Beth Leavel stars as the witty and comedic leading lady of "Call Me Madam"-Mrs. Sally Adams. “Call Me Madam,” far too long overlooked, finally receives the ideal production that its campy political satire and lush romantic fantasy requires in the hands of Lyric Artistic Director Michael Baron. His choice of Beth Leavel, with her warm, strong voice and perfect comic timing to carry the leading role as Mrs. Sally Adams, allows the well-made, mid-Century Broadway musical style to shed a bright renewed light on that time-honored tradition. 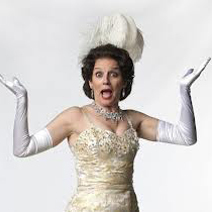 Broadway’s penchant for comedy and fantasy romances like “Call Me Madam” sometimes hung on the slim threads of a current well known personage and a slim, political fact, particularly after WWII, and bled over into the early ‘50s. The plots usually included a love ballad or two for the leads and a number or two for the chief supporting players, as well as production numbers to locate the plot, and a trio or quartet piece for comic relief. The end aim was a storybook wished-for-ending and a hummable tune or two for the patrons on their way home. In “Call Me Madam” (1950) Beth Leavel portrays folksy Sally Adams, broadly and wildly based on Perle Mesta, daughter of Oklahoma oilman Billy Skirvin of Skirvin Hotel fame. Mrs. Mesta’s husband, a steel magnate, reportedly left her $78M upon his death at 63. Still relatively young and attractive, Mrs. Mesta decided to try her hand at politics by putting her lavish monetary power to good use. Settling in Washington, D. C., Mrs. Mesta became known for wonderful parties and her ability to gather around her famous politicians and celebrities on both sides of the aisle. She especially backed Democrats she believed in, and President Truman rewarded her with the post of Ambassador to Luxembourg. By playing off the conventional redneck personae of Oklahomans already developed on stage and in films, show book authors Lindsay and Crouse made the most of topical political satire and left the fantasy and romance to one of Irving Berlin’s best musical scores. In reality, Mrs. Mesta (“The Hostess With the Mostes’ on the Ball”) was not at all like Sally Adams other than as the provider of quite successful parties for politicians and causes. Interviews with Mesta are currently available on YOU TUBE, where she appears to be well spoken, cultured and charming. As a patriotic American abroad she took great pleasure in inviting 1,000 U. S. service men and women each month to a reception at the embassy in addition to her official affairs. In “Call Me Madam” Berlin’s lovely score provides an opportunity to present a cornucopia of exquisite popular dance styles which range from folk routines through waltzes, fox trots, soft shoe taps and South American numbers. The large production numbers use the entire cast, backed by sumptuous staging, and stand out. The careful and colorful choreography is the fine work of Amy Reynolds Reed; and the forms are arranged and styled following the patterns set according to the pre-“West Side Story” talents of a quite young Jerome Robbins. Robbins, recognized especially for the energetic fluidity, variety and synergy of his style, later became so well established on Broadway that a special show—“Jerome Robbins’ Broadway” was composed from his repertory of hit dances from such shows as not only “Call Me Madam” and “West Side Story,” but also “The King and I,” “On the Town,” “Funny Girl,” “Peter Pan,” “Bells Are Ringing,” “Gypsy,” and “Fiddler on the Roof,” and several others. Robbins’ life-long commitment to dance continued with his association with George Balanchine at the New York City Ballet. I mention this bit of dance history because once again the “Call Me Madam” choice of Director Baron adheres to this year’s tribute to dance diva Chita Rivera. Following the post WWII choice, gowns with small waists and bouffant skirts at near ankle lengths, first established in the Dior era, are highlights costume designer Jeffrey Meek supplies in a rainbow of hues. The effect is quite a splendid display of perhaps the loveliest period of feminine fashions of the 20th century. Mainbocher created the original costumes for the show. Over the years “Call Me Madam” set the course for several of its hits to become part of the American Standards songbook. In Act I “It’s A Lovely Day Today,” sung and danced to in the show by the winsome couple, Molly Rushing and Jeremy Benton, the royal and the commoner, to suggest that this is the ideal time for lonely young lovers to engage, is the first. The second hit, an endearing piece called “The Best Thing for You (Would Be Me)” is delivered by Beth Leavel, as the heiress/commoner, and outstanding Steve Blanchard, as the royal representative. Act II doubles the pleasure with favorites “Something to Dance About,” featuring Leavel and company, and “You’re Just in Love,” with Leavel and Benton. Besides the supremely talented leads, special kudos go to the political trio, two Senators, Brockbank (Tom Huston Orr) and Gallagher (Brian Stockton), and Congressman Bill Wilkins (Adam Heller), who score applause with their quick political jabs and lusty voices. Mateja Govich, a last minute cast replacement due to an illness, shines in his perfect comic villager characterization as Sebastian Sebastian. Other well-experienced and popular local talents chosen by Baron for key supporting roles include Charlie Monnot as Hugo, Marilyn Govich as Grand Duchess Sophie, Robert Matson, as hilarious Grand Duke Otto, and Eric Mac Naughton, portraying Pemberton Maxwell. On Broadway “Call Me Madam” was produced for a mere $250,000, brought in $4M, won four Tonys, and ran for 446 performances. Thank you, Michael Baron, for presenting such a fresh, attractive show. Performances continue at Civic Center Music Hall through Saturday evening. For tickets, call 524-9312. On the Internet, the address is www.lyrictheatreokc.com.